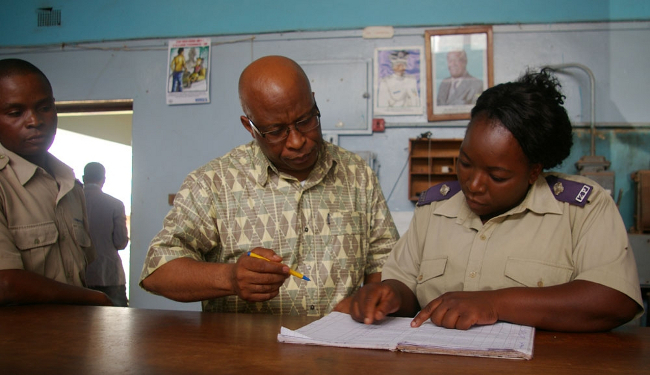 Police in Lusaka have summoned MMD President Nevers Mumba for questioning following his appearance on a radio programme on Joy FM last Thursday. The Watchdog reported the same day that ailing dictator Michael Sata personally phoned the radio station to order them to cancle the programme but the radio station refused. Frustrated and angry, Sata sent Cosmo Mumba to insult Dr Mumba. But Dr Mumba being a mature person and a Christian just continued with his programme of anlaysing the PF failures in the past two years. But this angered Sata who has now told the police to find a crime against Dr Mumba and charge him. Lusaka Police Commissioner Joyce Kasosa confirmed that Dr Mumba was summoned to appear on Friday but asked for more time to prepare. “Yes we sent a call out to his residence but he asked for more time. We have then settled for Monday at 10 Hours. It’s a routine investigation and we just want him to help us with investigations. I cannot give you more details now,” Ms Kasosa said. On the radio, Dr Mumba gave a detailed and objective analysis of the two-year rule of the PF but this annoyed Sata. And some police sources have disclosed that Dr Mumba is likely to be charged with Defamation of the President. “We are under instruction to find something in his interview at Joy FM to charge him for and our boss wants him to be slapped with defamation of the President,” a police source revealed. Dr Mumba referred to President Sata as a man who thrives in a state of confusion and that he is sitting on a throne created using lies. “The country is a state of confusion because President Sata cannot govern without confusion. He thrives in confusion. Zambia will always be in a confused state because the Head of State likes confusion,” Dr Mumba said during the radio programme.